The Stamina Elite Total Body Recumbent Exercise Bike 15-9100C is designed to put you in a semi-reclined position so you work all the major muscles in your hips, thighs, and buttocks while you get a great cardiovascular workout. 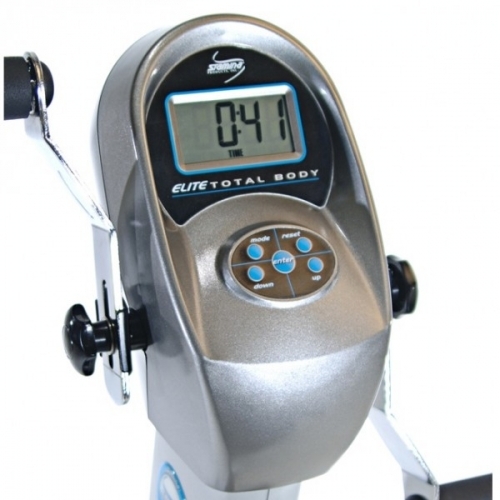 And the Stamina Elite Total Body Recumbent Bike Bike 15-9100C tones the upper body with rotating handlebars so your hands "pedal" to work your arms, shoulders, and back. 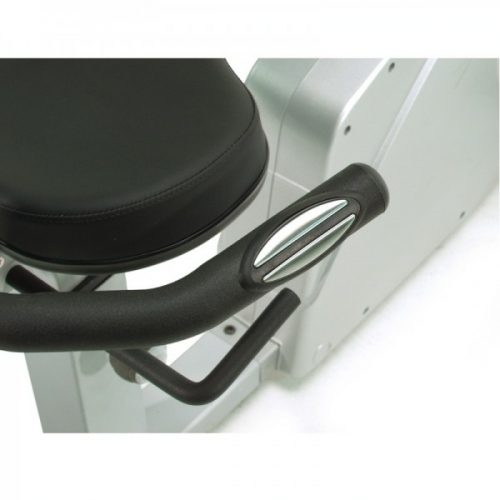 The tension knob on the Stamina Elite Total Body Recumbent Exercise Bike 15-9100C can be adjusted to any of eight levels to increase or decrease the workout intensity anytime without interrupting your workout. The adjustable, heavy-weighted flywheel resistance and belt drive train gives you smooth pedaling at any resistance level. Stationary cycling is one of the most effective low-impact aerobic exercises for increasing your metabolism to burn calories and fat more efficiently. Because there isn't heavy impact on your joints, stationery cycling can be a lifelong form of exercise. For effective aerobic exercise, work within your target heart rate zone (70% to 85% of your maximum heart rate). A heart rate monitor will give you the constant feedback you need so you stay within your target heart rate zone. 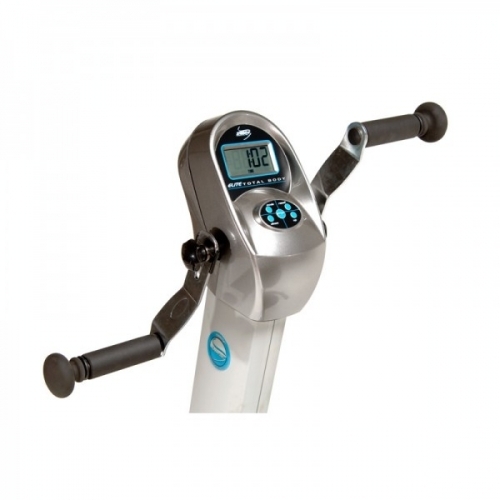 The Stamina Elite Total Body Recumbent Exercise Bike 15-9100C includes an electronic monitor to measure your speed, calories burned, distance, and pulse. The electronic monitor is battery-operated so there is no need for an electrical outlet. The handrails' built-in pulse sensors take your pulse for display on the electronic monitor. 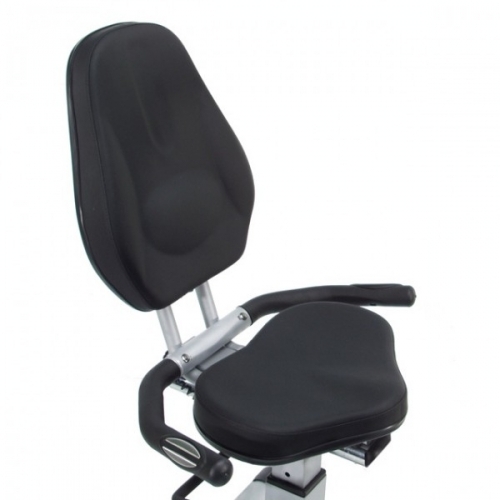 The seat is padded for comfort and adjustable to fit any size rider, and the oversized foot pedals and adjustable foot straps hold your feet securely to improve pulling motion while pedaling. Exercise bikes without this feature have the pushing motion only and not the more advantageous pushing/pulling motion. With a footprint of just 49 5/8" long x 23 5/8" wide and a height of 48 5/8", the Stamina Elite Total Body Recumbent Exercise Bike 15-9100C takes up much less space than other recumbent exercise bikes. 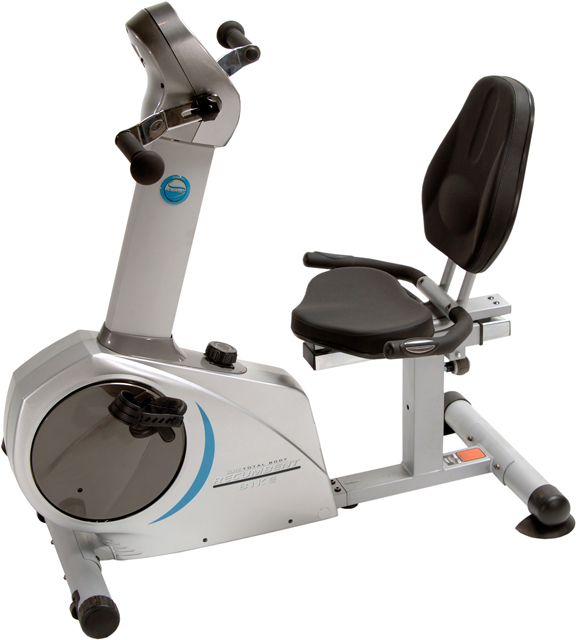 Order your Stamina Elite Total Body Recumbent Bike Bike 15-9100C from FitnessZone.com today! Call 1-800-875-9145 to chat with one of our friendly agents at FitnessZone and learn more about the Stamina Elite Total Body Recumbent Bike Bike 15-9100C. 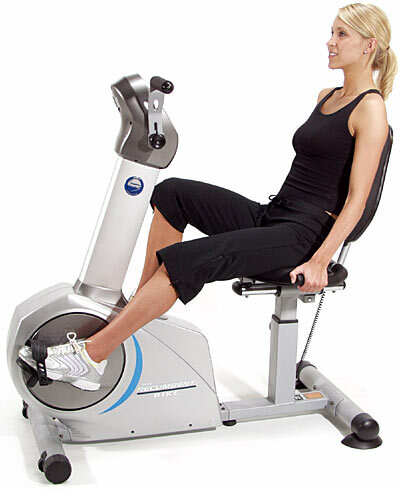 Order your Stamina Elite Total Body Recumbent Bike Bike 15-9100C from FitnessZone.com today!